Can you find this quote? That is not the exact quote but it is the idea. I thought it was from G. Harry Stine; Obviously it can’t be from any edition of his “Handbook of Model Rocketry” which has lead thousands of people into careers in the Space Industry, as that one has gotten uncountable reviews over the years. Even SSI SA and former SSI Executive Director Gregg Maryniak’s new ebook “Fearless Experiments with Microcomputers” gives that Stine a glowing mention. Perhaps it was in “The Space Enterprise” – but that one has received accolades and the mentions from Gene Roddenberry and Robert A. Heinlein alone had the weight of worlds all by themselves. So, was it “The Third Industrial Revolution“? – sometimes called “The Other High Frontier” – in which Stine gratefully acknowledged the contributions of major Space names including Krafft A. Ehricke, Dandridge M. Cole, Dr. Jerry Pournelle, Dr. Peter Vajk, Isaac Asimov, Arthur C Clarke along with many “SSI names” including Dr. Peter Glaser, Dr. Gerard K. O’Neill, Keith Henson, Gerald Driggers, Gary Hudson and others. Except for “Handbook of Model Rocketry” and the popular mass market “Living in Space” none of these must-read Stine books on the technologies and ramifications of Space Manufacturing have been Kindle-ized so a simple search of your digital collection likely won’t bring up the location of that quote, but if you know the one we’re looking for please let us know. It’s a deep quote that’s worth taking to heart so we’d like to get it right. I really thought it was a Stine so it might be in any of the ones mentioned and perhaps my eyes just aren’t seeing right now. 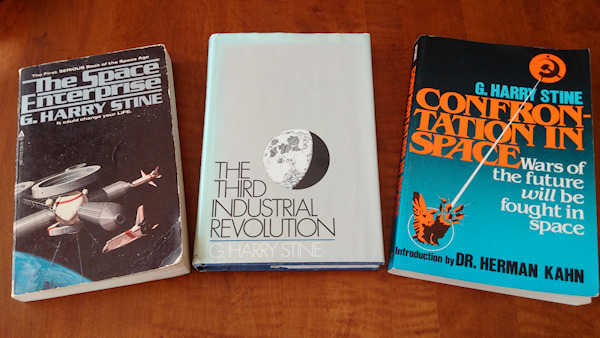 If you have not personally read these Classics of the Space Industry perhaps you could get your own copies and do the search? I have a strong feeling that it will pay off for you even if you don’t find that particular sentence. YES! I think that is it. Not quite as I remembered but close. Thank you Jay. Figures I can’t find my copy of Space Power so I’ll order another from a Merchant (and as soon as it shows up I’ll find my first one). Thanks for your help!